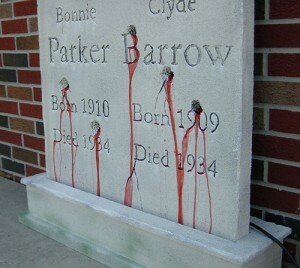 Mourning Cemetery & Manor have a really good tutorial on how to build a bleeding tombstone. 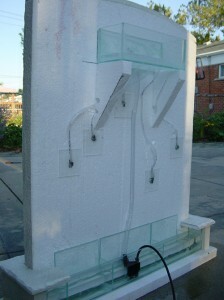 The trick to this one involves two plexiglass blood tanks, the main tank is mounted in the styrofoam base and a secondary tank is mounted above the bullet holes. A 1/2″ tube feeds the blood from the main tank to the secondary tank, while 1/4″ tubes drain the blood down into the bullet holes. This setup allows for the blood to slowly seep out of the holes rather than flowing out at an unnatural rate.